Chaos to Clarity | Audio Course by Heather Vickery | Vickery and Co.
Are you ready to to go from unsure, unorganized, or unmotivated to figuring out what exactly you want AND how you will make it happen? REGISTER FOR CHAOS TO CLARITY! You are? Well, let me throw a wrench in your plans: We are hard-wired to resist change. It’s a survival instinct on a primal level that makes it so hard for us to forge a new path toward anything when we don’t have all the answers. That’s why making important choices or drilling down into what we really want, and putting action steps in place is so uncomfortable. But, here is what I know for sure: Everything You Want is Just on the Other Side of Uncomfortable. I’m willing to bet you are a hard worker and have a few amazing accomplishments under your belt in life and business. But, lately you’re feeling stuck, frustrated, bored, or like you are somehow self-sabotaging your own efforts to move toward a big dream. Or maybe, you simply feel like you want more, or something different. Yet you are unsure what you actually want or how to get there. Well, friend, You’re not alone. Remember, we’re hard-wired to resist change add the internal pressure to succeed and going this path alone can feel extremely daunting. But, it doesn’t have to be that way! The only difference between you and the people you see living out their dreams is that they figured out how to get from Point A to Point B. COURSE BEGINS APRIL 17, 2019. SPACES ARE LIMITED. SECURE YOUR SPOT NOW! Create healthy relationships and boundaries so you have more energy for yourself and can be a better caregiver to your loved ones? Have a step-by-step plan to make your goals come to life? Feel good at the end of the day, week, month and year? Know that you are in control of your life? Switch jobs and build your dream business or get promoted? Breakthrough and move beyond thought patterns that hold you back? With just ONE MONTH’s worth of work for with only a few hours per week, you can gain the clarity and create the steps you need to build the future you truly and deeply desire. My solution for you is intense, deep diving, and satisfying for those who are ready to move to the other side of uncomfortable and achieve major movement on your dream life and business. Chaos to Clarity is a Roadmap to Personal and Professional Success. It’s built from proven methods I’ve used to help myself, my 1:1 clients and workshop attendees find clarity and take action, from whatever state of chaos they are currently living in. 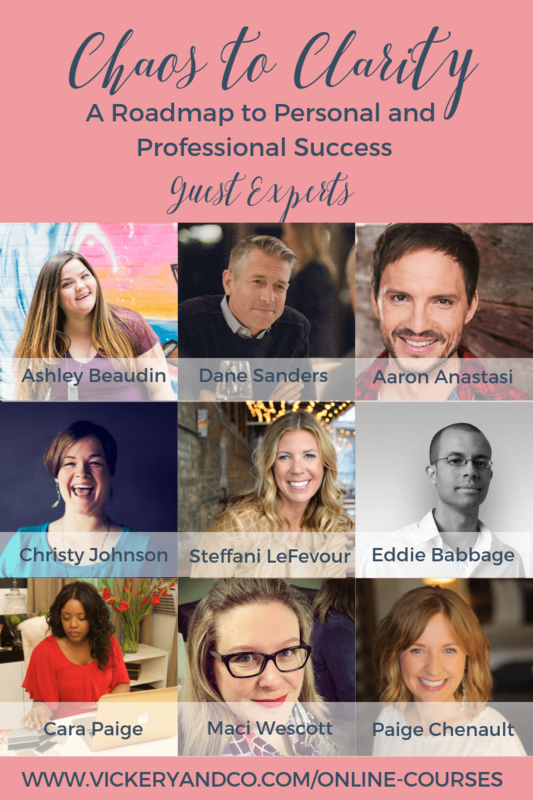 We are excited to announce our fantastic guest experts! These guests add their expertise to an already exciting course. Hard to beat this! Ashley Beaudin from The Imperfect Boss Campaign. Dane Sanders Celebrated Public Speaker, Author, and producer of the GO Summit from Fastermind. Aaron Anastasi, Best-SellingAauthor, and Speaker. Christy Johnson, Artist, and Creative Mentor. Eddie Babbage, Founder of Timeline Genius and Host of Wedding Industry Insiders Podcast. Cara Paige, Founder of Cara Paige Creative. Maci Wescott, Marketing Systems an Strategy Consultant. Paige Chenault, Founder of The Birthday Party Project and Celebrated Public Speaker. 16 audio lessons that you can listen to on your own time. The mp3 format makes the lessons easy to download and listen to in your car, while working out, or simply as a reflective break from your daily grind. Audio episode length varies from 5 short minutes to 50 minutes for the longest episode. So, you can listen to about 4 per week as we work through them at that pace together. A beautiful fillable workbook that you can use to record your answers electronically, or print out if you prefer. No matter how you choose to fill in your workbook, I ask that you also put pen-to-paper after each lesson and do some open, reflective, journaling. This step is possibly the most revealing and could provide you with the most valuable insight needed on this path. Weekly group coaching sessions where you can connect with others on the same path as you and connect with me to dive further into what you are unveiling through this process. Two cohorts to choose from – morning or evening – to fit your schedule. All sessions will be recorded and you will have access to them for four (4) months from date of purchase. The cherry on top of this entire experience is that I am 100% committed to your success in this program. So much that, at the end of our month together, you show me that you did the workbook assignments and journaling… and I give you a 1:1 personal coaching session to ensure the work you’ve done here is packaged up neatly for action and that you are ready to soar! Turn in your completed workbook and receive a FREE 1:1 coaching session with Heather. Because we believe that GIVING IS GOOD, 10% of all proceeds from this course will benefit The Birthday Party Project. Is Chaos to Clarity for you? You are ready to lay a foundation to make something happen in your life, even if you don’t yet know what that is. You want to get un-stuck. You know what you want and need help drawing a roadmap to get there. You want to move, NOW. You don’t want to be back here in a few months wishing you had already done the work. You don’t want to learn how to make things happen in your life. You don’t want to do the self-work or move past your discomfort. You’ve achieved all of your dreams and meeting your goals is never a challenge. I don’t have the money for this right now. Now, let me just say that most people aren’t as broke as they think they are! If you haven’t been able to make your dreams come true, it’s time to get real and realize that you need some guidance. My experience has been that this is the easiest excuse we tell ourselves in order to stay comfortable. Consider what you will have in hand after our month of intensive work is over. You will have all the self-work done and all the elements in place to move closer to the life you want to live. You will also be able to re-use this method and guided practice again and again in your life every time you set goals and want to make sure they will happen. Chaos to Clarity is an investment in yourself, your future, and your ability to make things happen. I don’t have the time for this right now. This excuse is worse than thinking you don’t have the money! If you are truly unable to devote 2-3 hours per week of time working on yourself and creating a plan to achieve your dreams, then you need this work more than anybody… because what you are saying is that you are not worth setting time aside for. Did you know that some of the busiest and most successful people in the world including Oprah, Bill Gates, Warren Buffet, and President Barack Obama adopt what is called the “5 Hour Rule” – you can google it if you want. But, they commit to 5 hours per week of dedicated learning and personal development. Now, if anyone has an “I don’t have time for that” excuse, it’s that list of super achievers. Yet, they understand the importance of investing time for continual development, pushing through discomfort, and moving toward major success. I don’t have the desire to do the work that could positively impact the rest of my life. I can tell you that I believe you can find a way to pay the course and carve time of your day to do the work. I can point out that those are the two most popular excuses ever to resist making breakthroughs. But, the one thing you do need to have is a drive and desire to do the work, be open to change and put your plan into action. If you have a baseline desire to make things happen in your life, Chaos to Clarity will give you the tools, support and accountability to make those things happen. All you need to bring is your drive and desire. Q: HOW DO I ACCESS THE COURSE? Each week, you will receive an email with links to that weeks content! Everything is stored in a google drive. It’s as simple as that! Q: HOW WILL I STAY ON TRACK? Don’t worry! We will be sending emails reminding you about the course work, group coaching calls and always available to help you with any questions or concerns. Q: WHAT IF I CANNOT ATTEND THE GROUP CALLS? We strongly encourage you to make time for these calls, as they are super important for the success of the course. That said, we will be recording the calls and you will have access to them for up to two months. Don’t worry! We will be sending emails reminding you about the coursework, group coaching calls and always available to help you with any questions or concerns. Q: OTHER THAN THE GROUP CALLS AND MY 1:1 CALL, WILL I HAVE ACCESS TO HEATHER? Yes! If you ever have questions or need some extra support, you can email Heather at any time during the month. Q: HOW DO I GET THE MOST OUT OF C2C? This course will be as successful as you want it to be. If you show up each day, with a positive attitude, and are willing to put in the work – you will be amazed at the results! Q: WHAT IS REQUIRED FOR MY 1:1 COACHING CALL WITH HEATHER? As long as you complete the course workbook and submit it to Heather within two weeks of the final group coaching call, you will be eligible for the 1:1 coaching session. Register now for Chaos to Clarity. The course begins on April 17, 2019.